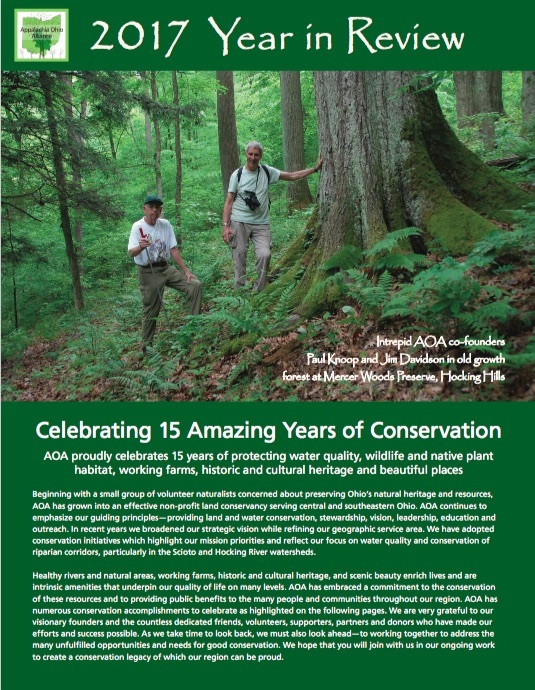 AOA is joining with The Canal Society of Ohio to help sponsor a guided bus tour and field trip along the historic Hocking Canal route in Hocking and Fairfield Counties. This event, “Going Up the Hocking Canal – Logan to Carroll”, is the annual fall outing of the Canal Society which visits the Hocking Hills this year. As an added bonus to enjoying the interesting historic canal sites, features, history and stories, participants will be able to delight in nature’s fall color display as the tour will take place on the traditional peak fall color weekend in the Hocking Hills. Expect to be treated to the spectacular red, yellow and orange maple trees that line the street in the Village of Sugar Grove, as well as many other fall displays along the tour route. 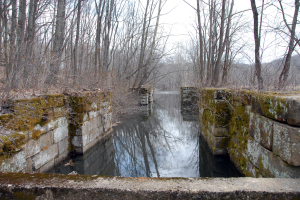 As part of the tour we will visit several sites recently conserved by AOA as well as several properties with extant canal features that AOA is working to preserve as part of our Hocking Canal Heritage Corridor Initiative. Friday Night, Ocotber 17 7:00 PM Opening Reception at the Hocking County Historical Society. Enjoy light refreshments and a brief introductory Hocking Canal history presentation by Dave Neuhardt, Secretary of the Canal Society Board. Dave is also the Secretary of the Tecumseh Land Trust Board of Directors, one of our sister land trusts based in Yellow Springs, Ohio. Bus Tour and Ramble along the Route of the Hocking Canal. 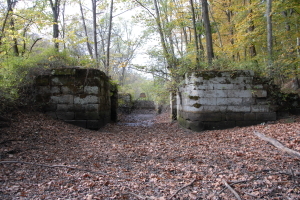 This day-long tour will be guided and narrated by distinguished Hocking Canal historian Dave Meyer. We will travel from Logan to Carroll with planned pullovers to visit key canal features. Includes a rest stop for lunch at historic Mathias Grove, a fabulous AOA conservation property in Rockbridge. Some “off-trail” walking will be required to visit specific sites so please dress appropriately. Expect to return by 4 p.m. Bus departs from the Holiday Inn Express in Logan. Saturday Night, October 18 6:00 PM Social Hour and Dinner at the Olde Dutch Restaurant in Logan. 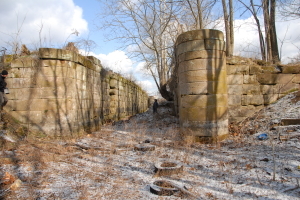 Learn about AOA’s ongoing work to conserve canal remnants and plans for a Hocking Canal Heritage Corridor, presented by Executive Director Steve Fleegal. All activities are open to the public. Feel free to participate in any or all three event activities. The Friday Reception is free. There is a $65 per person charge for the Bus Tour to cover the rental expense, tour guide booklet and the box lunch. The Saturday night Dinner cost is $30 per person. All participants must register with The Canal Society of Ohio. Registration forms are available by by visiting the Activities section of The Canal Society of Ohio website: www.canalsocietyohio.org. The deadline to register for the Canal tour and dinner activities is Saturday, October 11th. Please contact Kay Sheldon (kcsheldon3342@yahoo.com / 440-327-3816) for any registration questions or Dave Meyer, (meyer-david1938@att.net / 614-364-1262) for general event questions. Those interested in learning more about the Hocking Canal can pick up a copy of David Meyer’s informative book, Fifty-six Miles into the Hills, The Story of the Lancaster Lateral & Hocking Canals. This book includes many period photographs along with fascinating stories and history of the canal as well as early development of communities and natural resources in the Hocking River valley. Pre-event, this book is available for purchase from the Fairfield Heritage Association at the Georgian Museum in Lancaster. During the event, copies will be available for purchase from the author. Plan to join us and enjoy Ohio’s Hocking Hills country canal history and beautiful outdoor scenery this fall.